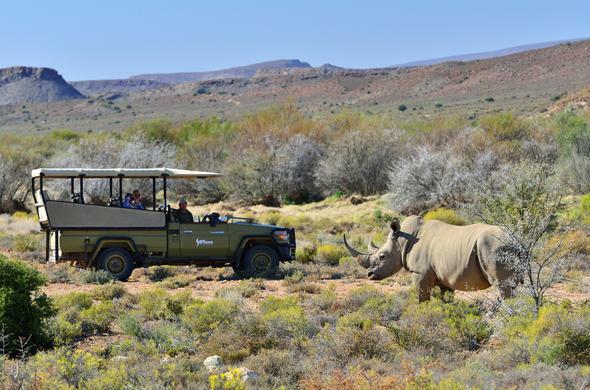 Sanbona Wildlife Reserve in the Little Karoo is famous for its breathtaking beauty and the indigenous fauna and flora. At the foot of the Warmwaterberg, in the heart of the Little Karoo, between Montagu and Barrydale on the famous Route 62, is the beautiful Sanbona Wildlife Reserve. Sanbona Wildlife Reserve is situated in 54 000 hectares of undulating mountains and plains, indigenous fauna and flora, rock formations and rock art that make this a destination not to be missed. Specialist guiding is a key element in providing a memorable and varied experience. The name Sanbona is a combination of the 'San' people (Bushman) who roamed this area for thousands of years and 'bona' which represents their vision in order to position this portion of the Little Karoo. Be it a journey of rejuvenation and self-discovery or absorbing the various essences and activities, Sanbona Wildlife Reserve represents in true form the philosophy of taking care of the small things in life. Be it a high-powered break for executive decision-making or an incentive getaway, Sanbona Wildlife Reserve offers a venue with a difference. A private Boardroom for 12 delegates with standard audio-visual and conference equipment is available at Tilney Manor. Discover the spirit of the Little Karoo on foot and see the little things of the reserve through the eyes of the San. With the guidance of your experienced ranger, early morning walking trails to greet the day have been developed to cater for individual needs. From gentle strolls, taking in the breathtaking beauty of the indigenous fauna and flora, to challenging trails discovering isolated vistas, reveal the beauty of Sanbona Wildlife Reserve.